, the investor funds her investment in the market index with her initial wealth plus borrowed money; such portfolios are referred to as “borrowing” portfolios. ). If the investor purchases an average risk security, then its beta is 1 and the expected return on such a security is the same as the expected return on the market. On the other hand, if the security is riskier (safer) than an average risk security, then it’s expected return is higher (lower) than the same as the expected return on the market. If the expected return on a security is higher (lower) than the expected return indicated by the CAPM equation, this means that the security is under-priced (over-priced). Investors will recognize this mispricing and bid up (down) the under-priced (over-priced) security until its expected return conforms to the CAPM equation. According to the CAPM, only systematic (i.e., non-diversifiable) risk is priced. Systematic risks are risks which are common to all firms (e.g., return fluctuations caused by macroeconomic factors which affect all risky assets). On the other hand, unsystematic (i.e., diversifiable) risk is not priced since its impact on a diversified asset portfolio is negligible. Diversifiable risks comprise risks that are firm-specific (e.g., the risk that a particular company will lose market share or go bankrupt). indifference curves for investors with high (low) degrees of risk tolerance (aversion) are less steeply sloped than indifference curves than for investors with low (high) degrees of risk tolerance (aversion)). Optimal portfolios (i.e., portfolios that maximize expected utility) occur at points of tangency between indifference curves and efficient frontier. space. The same selection principle holds as in the previous point (point 2); i.e., investors determine optimal portfolios by identifying the point of tangency between their indifference curves and the efficient frontier. 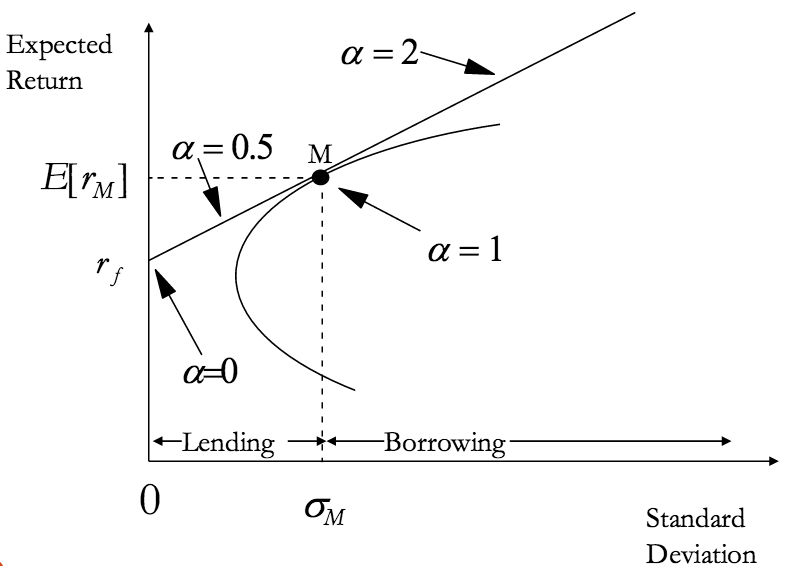 This occurs on the capital market line (CML) where the Sharpe ratio is maximized; everyone chooses some combination of the risk-free asset and the market portfolio, and risk tolerance determines whether the point of tangency involves either a lending (low risk tolerance) or borrowing (high risk tolerance) allocation strategy. Yesterday’s Finance 4335 class meeting on the topic of portfolio theory positions us well for tomorrow’s discussion of capital market theory. Work in these particularly important areas of finance subsequently won Nobel Prizes for their proponents; specifically, the portfolio theory topic won Harry Markowitz the Nobel Prize in Economics in 1990, and William F. Sharpe shared the 1990 Nobel Prize with Markowitz for his work on capital market theory. Financial markets serve a key purpose in a modern market economy by allocating productive resources among various areas of production. It is to a large extent through financial markets that saving in different sectors of the economy is transferred to firms for investments in buildings and machines. Financial markets also reflect firms’ expected prospects and risks, which implies that risks can be spread and that savers and investors can acquire valuable information for their investment decisions. The first pioneering contribution in the field of financial economics was made in the 1950s by Harry Markowitz who developed a theory for households’ and firms’ allocation of financial assets under uncertainty, the so-called theory of portfolio choice. This theory analyzes how wealth can be optimally invested in assets which differ in regard to their expected return and risk, and thereby also how risks can be reduced. A second significant contribution to the theory of financial economics occurred during the 1960s when a number of researchers, among whom William Sharpe was the leading figure, used Markowitz’s portfolio theory as a basis for developing a theory of price formation for financial assets, the so-called Capital Asset Pricing Model, or CAPM. The contribution for which Harry Markowitz now receives his award was first published in an essay entitled “Portfolio Selection” (1952), and later, more extensively, in his book, Portfolio Selection: Efficient Diversification (1959). The so-called theory of portfolio selection that was developed in this early work was originally a normative theory for investment managers, i.e., a theory for optimal investment of wealth in assets which differ in regard to their expected return and risk. On a general level, of course, investment managers and academic economists have long been aware of the necessity of taking returns as well as risk into account: “all the eggs should not be placed in the same basket”. Markowitz’s primary contribution consisted of developing a rigorously formulated, operational theory for portfolio selection under uncertainty – a theory which evolved into a foundation for further research in financial economics. Markowitz showed that under certain given conditions, an investor’s portfolio choice can be reduced to balancing two dimensions, i.e., the expected return on the portfolio and its variance. Due to the possibility of reducing risk through diversification, the risk of the portfolio, measured as its variance, will depend not only on the individual variances of the return on different assets, but also on the pairwise covariances of all assets. Hence, the essential aspect pertaining to the risk of an asset is not the risk of each asset in isolation, but the contribution of each asset to the risk of the aggregate portfolio. However, the “law of large numbers” is not wholly applicable to the diversification of risks in portfolio choice because the returns on different assets are correlated in practice. Thus, in general, risk cannot be totally eliminated, regardless of how many types of securities are represented in a portfolio. In this way, the complicated and multidimensional problem of portfolio choice with respect to a large number of different assets, each with varying properties, is reduced to a conceptually simple two-dimensional problem – known as mean-variance analysis. In an essay in 1956, Markowitz also showed how the problem of actually calculating the optimal portfolio could be solved. (In technical terms, this means that the analysis is formulated as a quadratic programming problem; the building blocks are a quadratic utility function, expected returns on the different assets, the variance and covariance of the assets and the investor’s budget restrictions.) The model has won wide acclaim due to its algebraic simplicity and suitability for empirical applications. Generally speaking, Markowitz’s work on portfolio theory may be regarded as having established financial micro analysis as a respectable research area in economic analysis. With the formulation of the so-called Capital Asset Pricing Model, or CAPM, which used Markowitz’s model as a “positive” (explanatory) theory, the step was taken from micro analysis to market analysis of price formation for financial assets. In the mid-1960s, several researchers – independently of one another – contributed to this development. William Sharpe’s pioneering achievement in this field was contained in his essay entitled, Capital Asset Prices: A Theory of Market Equilibrium under Conditions of Risk (1964). The basis of the CAPM is that an individual investor can choose exposure to risk through a combination of lending-borrowing and a suitably composed (optimal) portfolio of risky securities. According to the CAPM, the composition of this optimal risk portfolio depends on the investor’s assessment of the future prospects of different securities, and not on the investors’ own attitudes towards risk. The latter is reflected solely in the choice of a combination of a risk portfolio and risk-free investment (for instance treasury bills) or borrowing. In the case of an investor who does not have any special information, i.e., better information than other investors, there is no reason to hold a different portfolio of shares than other investors, i.e., a so-called market portfolio of shares. What is known as the “beta value” of a specific share indicates its marginal contribution to the risk of the entire market portfolio of risky securities. Shares with a beta coefficient greater than 1 have an above-average effect on the risk of the aggregate portfolio, whereas shares with a beta coefficient of less than 1 have a lower than average effect on the risk of the aggregate portfolio. According to the CAPM, in an efficient capital market, the risk premium and thus also the expected return on an asset, will vary in direct proportion to the beta value. These relations are generated by equilibrium price formation on efficient capital markets. An important result is that the expected return on an asset is determined by the beta coefficient on the asset, which also measures the covariance between the return on the asset and the return on the market portfolio. The CAPM shows that risks can be shifted to the capital market, where risks can be bought, sold and evaluated. In this way, the prices of risky assets are adjusted so that portfolio decisions become consistent. 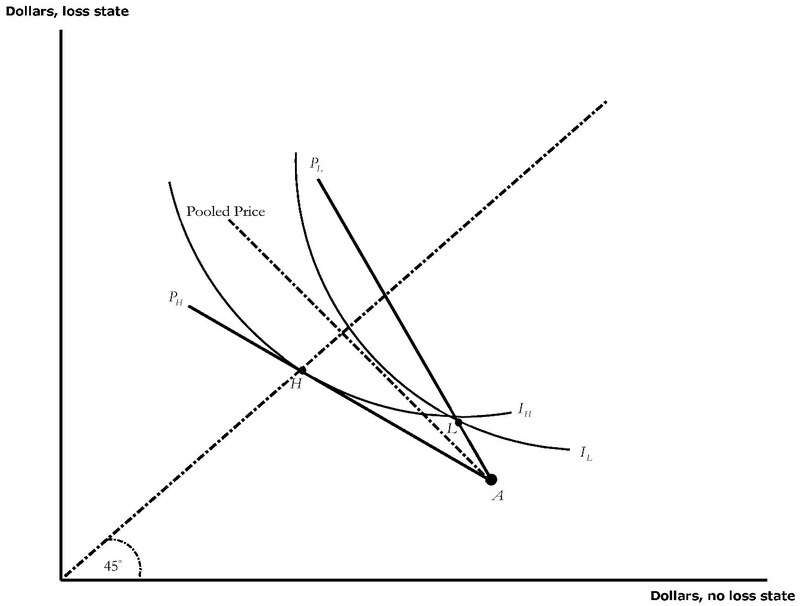 The CAPM is considered the backbone of modern price theory for financial markets. It is also widely used in empirical analysis, so that the abundance of financial statistical data can be utilized systematically and efficiently. Moreover, the model is applied extensively in practical research and has thus become an important basis for decision-making in different areas. This is related to the fact that such studies require information about firms’ costs of capital, where the risk premium is an essential component. Risk premiums which are specific to an industry can thus be determined using information on the beta value of the industry in question. Important examples of areas where the CAPM and its beta coefficients are used routinely, include calculations of costs of capital associated with investment and takeover decisions (in order to arrive at a discount factor); estimates of costs of capital as a basis for pricing in regulated public utilities; and judicial inquiries related to court decisions regarding compensation to expropriated firms whose shares are not listed on the stock market. The CAPM is also applied in comparative analyses of the success of different investors. Along with Markowitz’ portfolio model, the CAPM has also become the framework in textbooks on financial economics throughout the world. During tomorrow’s Finance 4335 class meeting, I plan to introduce the topic of adverse selection. Adverse selection is often referred to as the “hidden information” problem. This concept is particularly easy to understand in an insurance market setting; if you are an insurer, you have to be concerned that the worst possible risks are the ones that want to purchase insurance. However, it is important to note that adverse selection occurs in many market settings other than insurance markets. Adverse selection occurs whenever one party to a contract has superior information compared with his or her counter-party. When this occurs, often the party with the information advantage is tempted to take advantage of the uninformed party. A number of different strategies exist for mitigating adverse selection. In financial services markets, risk classification represents an important strategy. The reason insurers and banks want to know your credit score is because consumers with bad credit not only often lack the willingness and ability to pay their debts, but they also tend to have more accidents than consumers with good credit. Signaling is used in various settings; for example, one solution to the “lemons” problem in the market for used cars is for the seller to “signal” by providing credible third party certification; e.g., by paying for Carfax reports or vehicle inspections by an independent third party. Students “signal” their quality by selecting a high-quality university (e.g., like Baylor! :-)). Here the university provides potential employers with credible third-party certification concerning the quality of human capital. In product markets, if a manufacturer provides a long-term warranty, this may indicate that quality is better than average. The Rothschild-Stiglitz equilibrium cleverly restricts the menu of available choices in such a way that the insurer induces self-selection. 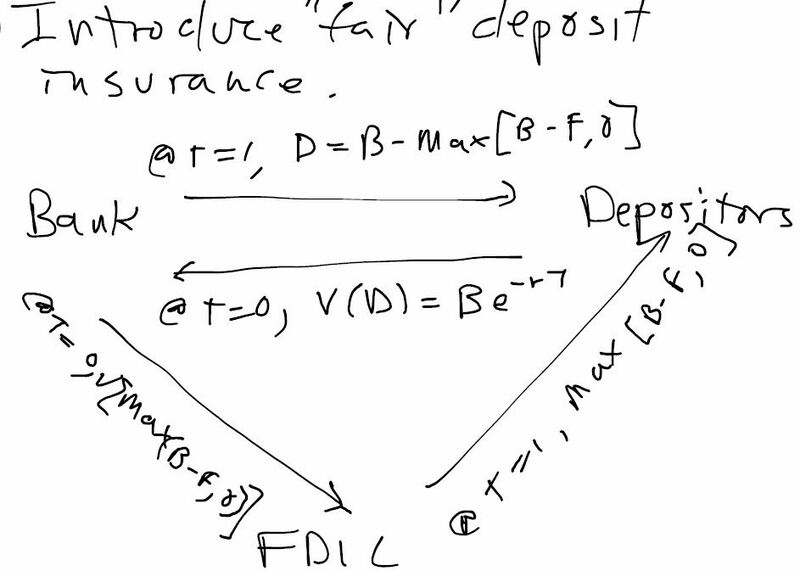 Here, the insurer offers contract L, which involves partial coverage at an actuarially fair price (based upon the loss probability of the low risk insured), and contract H, which provides full coverage at an actuarially fair price (based upon the loss probability of the high risk insured). The differences in the shapes of the indifference curves are due to the different accident probabilities, with a lower accident probability resulting in a more steeply sloped indifference curve. Here, the high-risk policyholder optimally chooses contract H and the low-risk policyholder optimally chooses contract L. The high-risk policyholder prefers H to L because L would represent a point of intersection with a marginally lower indifference curve (here, the Ih curve lies slightly above contract L, which implies that contract H provides the high-risk policyholder with higher expected utility than contract L). The low-risk policyholder will prefer L, but would prefer a full coverage contract at the point of intersection of APl line with the full insurance (45 degrees) line. However, such a contract is not offered since both the low and high-risk policyholders would choose it, and this would cause the insurer to lose money. Thus, one of the inefficiencies related to adverse selection is that insurance opportunities available to low-risk policyholders are limited compared with the world where there is no adverse selection. There is a very practical implication of this model. If you are a good risk, then you owe it to yourself to select high-deductible insurance, since insurers price low-deductible insurance with the expectation that high-risk policyholders will be the primary purchasers of such coverage (and therefore, low-deductible policies will be more costly per dollar of coverage than high-deductible policies. This Tuesday’s meeting of Finance 4335 will be devoted to a discussion of the concept of moral hazard. In finance, the moral hazard problem is commonly referred to as the “agency” problem. Many, if not most real-world contracts involve two parties – a “principal” and an “agent”. Contracts formed by principals and agents also usually have two key features: 1) the principal delegates some decision-making authority to the agent and 2) the principal and agent decide upon the extent to which they share risk. The principal has good reason to be concerned whether the agent is likely to take actions that may not be in her best interests. Consequently, the principal has strong incentives to monitor the agent’s actions. However, since it is costly to closely monitor and enforce contracts, some actions can be “hidden” from the principal in the sense that she is not willing to expend the resources necessary to discover them since the costs of discovery may exceed the benefits of obtaining this information. Thus, moral hazard is often described as a problem of “hidden action”. Since it is not economically feasible to perfectly monitor all of the agent’s actions, the principal needs to be concerned about whether the agent’s incentives line up, or are compatible with the principal’s objectives. This concern quickly becomes reflected in the contract terms defining the formal relationship between the principal and the agent. A contract is said to be incentive compatible if it causes principal and agent incentives to coincide. In other words, actions taken by the agent usually also benefit the principal. In practice, contracts typically scale agent compensation to the benefit received by the principal. Thus, in insurance markets, insurers are not willing to offer full coverage contracts; instead, they offer partial insurance coverage which exposes policyholders to some of the risk that they wish to transfer. In turn, partial coverage reinforces incentives for policyholders to prevent/mitigate loss. Similarly, in a completely different setting, consider the principal/agent relationship which exists between the owner and manager of a business. If the manager’s effort level is high, then the owner may earn higher profits compared with when the manager’s effort level is low. However, if managerial pay consists of a fixed salary and lacks any form of incentive compensation (e.g., bonuses based upon meeting or beating specific earnings targets), then the manager may be inclined to not exert extra effort, which results in less corporate profit. Thus, compensation contracts can be made more incentive compatible by including performance-based pay in addition to a fixed salary. This way, the owner and manager are both better off because incentives are better aligned. During today’s Finance 4335 class meeting, we compared and contrasted two methods for calculating risk premiums. Under the so-called “exact” method, one 1) calculates expected utility, 2) sets expected utility equal to the utility of the certainty-equivalent of wealth, 3) solves for the certainty-equivalent of wealth, and 4) obtains the risk premium by calculating the difference between expected wealth and the certainty-equivalent of wealth. On the other hand, the Arrow-Pratt method is an alternative method for calculating the risk premium which is based upon Taylor series approximations of expected utility of wealth and the utility of the certainty equivalent of wealth (the derivation for which appears on pp. 6-8 of http://fin4335.garven.com/spring2019/lecture6.pdf). Both of these approaches for calculating risk premiums are perfectly acceptable for purposes of Finance 4335. The value added of Arrow-Pratt is that it analytically demonstrates how risk premiums depend upon two factors: 1) the magnitude of the risk itself (as indicated by variance), and 2) the degree to which the decision-maker is risk averse. For example, we showed in class today that the Arrow-Pratt coefficient for the logarithmic investor (for whom U(W) = ln W) is twice as large as the Arrow-Pratt coefficient for the square root investor (for whom U(W) = W.5); 1/W for the logarithmic investor compared with .5/W for the square root investor. Thus, the logarithmic investor behaves in a more risk averse than the square root investor; other things equal, the logarithmic investor will prefer to allocate less of her wealth to risky assets and buy more insurance than the square root investor. Another important insight yielded by Arrow-Pratt (at least for the utility functions considered so far in Finance 4335) is the notion of decreasing absolute risk aversion (DARA). Other things equal, an investor with DARA preferences become less (more) risk averse as wealth increases (decreases). Furthermore, such an investor increases (reduces) the dollar amount that she is willing to put at risk as she becomes wealthier (poorer). During last Thursday’s class meeting, we discussed (among other things) the famous St. Petersburg Paradox. The source for this is Daniel Bernoulli’s famous article entitled “Exposition of a New Theory on the Measurement of Risk“. As was the standard practice in academia at the time, Bernoulli’s article was originally published in Latin in 1738. It was subsequently translated into English in 1954 and published a second time that same year in Econometrica (Volume 22, No. 1): pp. 22–36. Considering that this article was published 280 years ago in an obscure (presumably peer-reviewed) academic journal, it is fairly succinct and surprisingly easy to read. Also, the Wikipedia article about Bernoulli’s article is worth reading. It provides the mathematics for determining the price at which the apostle Paul would have been indifferent about taking the apostle Peter up on this bet. The original numerical example proposed by Bernoulli focuses attention on Paul’s gamble per se and does not explicitly consider the effect of Paul’s initial wealth on his willingness to pay. However, the quote on page 31 of the article (“… that any reasonable man would sell his chance … for twenty ducats”) implies that Bernoulli may have assumed Paul to be a millionaire, since (as shown in the Wikipedia article) the certainty-equivalent value of this bet to a millionaire who has logarithmic utility comes out to 20.88 ducats.